The Sd Kfz 10 was a half-track vehicle developed by Demag AG from 1934. It was initially designated the D6, but the final production model was the D7. The 10/5 vehicle was standard Sd Kfz 10 mounted with special rear superstructure with folding sides to allow full traverse for 2cm Flak38 L/112.5 gun. In July of 1939, first 370 Sd.Kfz.10/4 were produced mounting the earlier 2cm FlaK 30. In 1941 the 2cm Flak 30 gun of Sd Kfz 10/4 was replaced with newer 2cm Flak 38 gun and the vehicle was redesignated as Sd Kfz 10/5. Mechanische Werke in Cottbus produced the last 962 Sd Kfz 10/5 vehicles from 1943 to November of 1944. The early models were unarmored, but some later production models (Sd Kfz 10/5) were fitted with an armored driver's cab (made of thin 8mm plates) and armored plates to protect the radiator and engine. The Sd Kfz 10/5 was issued to FlaK units of the Luftwaffe and Wehrmacht. The anti-aircraft gun was not only used against aircraft but it also provided infantry support against ground targets. The Sd Kfz 10/5 can be taken as an option for the German Divisional Support Anti-aircraft Gun Platoon from Festung Europa (page 47) or the Light Anti-aircraft Gun Platoon of the Panzergrenadierkompanie (page 25, Festung Europa, or for Panzer Lehr page 28, Villers-Bocage). All these platoons allow you to upgrade the vehicle to the armored variant. The Armored Sd Kfz 10/5 has half-tracked mobility, Front armor 0, Side 0 and Top 0, giving it protection from small arms fire. 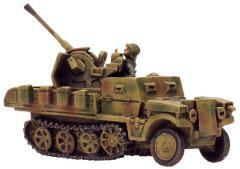 It is armed with the 2cm FlaK38 gun which has a range of 16”/40cm, ROF 4, AT 5 and FP 5+. It is a dedicated anti-aircraft weapon and can shot at any attacking aircraft in range during the enemy’s turn.